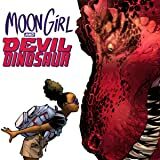 Collects Moon Girl and Devil Dinosaur #32-36. It’s time to cry S.O.S. — Save Our School! New York City has a new mayor, and his name is…Wilson Fisk! Yes, the Kingpin is in charge of the Big Apple, including the Department of Education! But he won’t be running it alone: meet your new favorite Marvel character, Princess Fisk! What is her tragic past? Meanwhile, Lunella’s problems are all in the present. 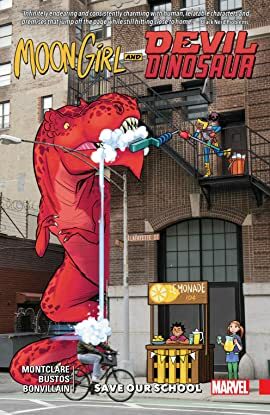 For one, if she’s so smart, why can’t she unravel the genetic mystery that keeps swapping her brain with a 40-foot-tall T. rex? Then, the DOE citywide exam is getting closer — and everyone is counting on Lunella to keep P.S. 20 at the top of the class! And to make matters worse, now her cousin has come to visit! Meet Devin Dinosaur! And what happens when the Wrecking Crew strikes?